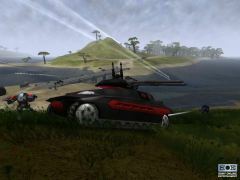 SOE’s PlanetSide isn’t your typical massively multiplayer online game. 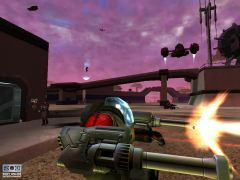 While there are some role-playing elements in the character building system, it’s less an RPG and more a straight-ahead action title that allows dozens of players to shoot it out simultaneously. 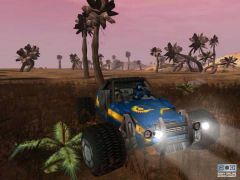 PlanetSide allows players to go into combat either on foot or with different vehicles. 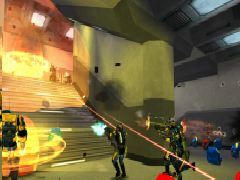 The game also offers more depth with it’s character class system, which allows players to form squads to effectively battle the other forces. The big question is whether this attempt at melding the scope of an MMPRG with the thumb-candy of a FPS work? Find out the answer as we enter this massive multiplayer melee. Sony Online Entertainment’s highly-addictive online EverQuest series has ensnared millions of players over the past few years by creating an a fully fledged world populated by thousands of characters who can communicate, talk and go on adventures with each another. While the gameplay has solid underpinnings, it’s the social aspect that keep players hooked. Now, SOE is applying this successful formula to another genre with the much more action-oriented title PlanetSide. PlanetSide, at its heart, is a sci-fi shoot-em up reminiscent of HALO that takes place on a desolate planet at the outer reaches of the universe. As the game begins, we learn that humanity has explored the far reaches of space and found wormholes that allow them to travel through space instantly. This has allowed the Terran Republic to earn a great deal of power and wealth, and they have ruled the universe for a thousand years. However, while exploring a distant planet, the wormhole that brough them there collapsed and stranded settlers on a distant planet named Auraxis. Isolated from the main governing body, the Terran Republic . After the hese warriors separated into three federations: The Terran Republic, who are loyal to the main governing body. Their direct rivals are the New Conglomerate. This federation is a rebel federation looking to unseat the Terrans As they explored Auraxis, the settlers discovered powerful alien technology, from a race known as the Vinu. The Vinu themselves seem to have vanished without a trace, leaving no sign of their fate. However, their technology is quite powerful, yet hard to understand. This means that each of the races utilizes the technology in very different ways. The technology is most actively persued by the Vinu Sovereignty, the third Federation battling for control. They are a religious group who worship the vanished alien race and have split off from the other Federation. The Vinu Sovereigns rely on this mysterious Vinu technology almost exclusively but are a little bit slower than the other Federations on Auraxis. While stranded, they have declared war on the others and are looking to control the planet. Your mission is to take as many of the rival federations’ spheres of influence as you can while defending the areas your federation controls. Which side you choose to play as affects the gameplay significantly, and each race has a different set of abilities, weapons and vehicles. For example, the Terrans are faster and have more firepower, but can’t use levitation. While the weapons and vehicles for each group are similar, they have different recoil and firing ranges.The races all have their pluses and minuses, but they generally seem to balance out well, making most battles a relatively fair fight. There are many similarities, and despite the minor weapons and tactical adjustments, PlanetSide’s basic gameplay doesn’t change much no matter what side you end up on. As the game begins, you can assign character traits including facial features and disposition, and customize your character’s appearance in a number of ways. You begin the game by entering your federation’s training area, the sanctuary. These are your main areas in the game where you can respawn, re-equip, meet other players and make Squads. Sanctuaries also feature Virtual Shooting Range and Virtual Driving Course where you can practice your moves, learn to control vehicles and earn some of the basic ranking certificates. These areas also act as default respawn points if you have not binded the character elsewhere. While it seems tedious to go through the training, it’s important to go through these training missions first, because if you immediately jump into the action with your basic weapons and armor, the other players will quickly make you roadkill. Going solo is also a recipe for disaster, and forming a squad (with up to ten other players) will increase your chances of survival. This teamwork function works extremely well and effectively immerses players into the game, and gives PlanetSide more tactical depth than traditional FPS titles. 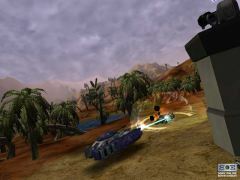 The world of Auraxis is divided into ten different continents, and players can move between them using either a warp gate or with the high altitude rapid transport (HART) shuttle. Each continent is connected to three others. Each continent is labeled with the sphere of influence and the location of allied and enemy bases. When you see enemies at close range, that usually means your base is under attack, and you should defend it. If you choose to go into a base, the best strategy is to do some investigation and locate any weak points before you run in with your guns blazing. After you’ve successfully dispatched any opponents, you can take over the base by having your hacker connect to the main terminal and convert its functions to your side. Capturing an enemy base isn’t as easy as it sounds, because each one has been reinforced in a number of ways. Their doors have been sealed, and players will have to unlock them using their hackers to unlock them. In addition, players will have to fight through some pretty heavy armor in order to penetrate to the next level. Obviously, most of these facilities won’t go down without a fight, and you’ll have to work long and hard to get close. This is a bit time-consuming, but most players should find the effort to break through the defensive lines to be extremely satisfying when successful. Understanding how the Battle Experience Points system works is important because you cannot gain access to different weapons and vehicles until you have earned these certificates. Every time you kill foes, destroy their equipment or take over their base, you’ll earn points. It’s extremely important to decide what type of character you’ll have, because once on that path, you’ll have to spend a lot of time ‘unlearning’ traits if you decide that character type isn’t for you. There are different points that you can use to buy your specialized certificates. In addition to character attributes, PlanetSide also makes you earn specific certificates for each vehicle type. However, you can ride in these vehicles as a passenger if you haven’t earned the certificate yet. What makes Planetside so interesting, is that there are several types of players you can use such as snipers, medics, soldiers and demolition experts. This definitely adds to the richness and immersion of the gameplay, giving it a lot of depth. While there is some overlap between them, each of these character types has unique abilities that offer the player a unique experience. For example, the stealth soldiers can sneak past guards undetected and build a beachhead inside an opposing base. Medics can revive fallen comrades or give them extra health. You’ll also need unique certificates for each ability, with different levels for each character. All squads should have a hacker as well, since these are essential to taking over the base. In addition to collecting enemy items, players will also find Matrixing terminals scattered around that you can manually bind yourself for re-spawning. However, players who are downed can also wait for a medic to revive them. It’s wise to take advantage of these when you see them because traveling back to a far-flung location can take a lot of time. PlanetSide’s experience system is a smartly-designed and rewards the adventurous player who takes risks, while allowing the novice player to build up a their level of competence quickly. Singing up and logging on is a simple task, the game uses Sony’s The Station website to make an easy interface that’s easy to set up and use. We found that the initial installation was quite simple and went off without a hitch. Playing the game online using a cable modem was an intense and seamless experience that rarely suffered from lag or hang-ups. 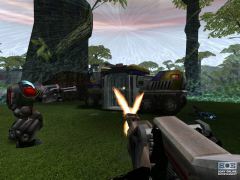 The ingenious use of the Sanctuaries makes for a transparent interface that makes forming squads and communicating with the other players feel natural. Obviously, the social interaction with the other players in your group is a key element of the game’s appeal, and the seamless online experience only enhances the experience of meeting and teaming up with other players. As a massively multiplayer online title, there are few compromises that need to be made, and this is most-evident in the graphics. While it doesn’t look as polished as your typical single player game, PlanetSide is one of the best looking online titles to date. The developers at SOE have done an excellent job in making the world of PlanetSide an evocative and challenging one. The environments are nicely detailed and the character animations are a bit above the par, making the experience a cut above the rest. The vehicle and weapon designs are richly detailed with high polygon counts and some cool lighting and special effects that pack an impressive visual punch. PlanetSide’s online world is cohesive and believable, which further makes the gameplay feel that much more intense. The game’s epic feel is only enhanced by the cinematic soundtrack, which adds heft to what is already an intense experience. Overall, PlanetSide shows a remarkable level of detail and realism for an online title, and is one of the most polished and beautiful multiplayer titles to date. PlanetSide’s emphasis is definitely on action, but the character-building elements, different playable character types and certificate system add a lot of depth to the gameplay. It’s co-operative team-based tactical combat is both challenging and fun. The ability to chat with other players, and the massive gameplay world makes the game feel like much more than a simple shooter. It has an epic feel that makes you feel like you are in the middle of a massive war. The simple interface is effective, allowing you to learn the basics quickly. The gameplay can get incredibly intense at points with dozens of players battling it out simultaneously. While up to this point, massively multiplayer titles have basically been blow up RPG’s, this attempt at melding the scope of these titles with the immediacy of a shooter succeeds on a number of levels. Overall, PlanetSide is an outstanding title from SOE that’s extremely addictive and keep you playing happily for quite some time.